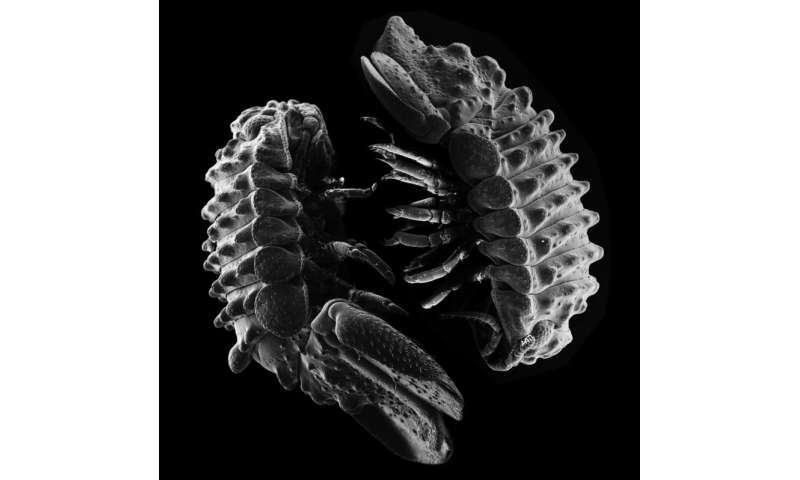 A new research paper published in the open access journal ZooKeys reports on a discovery made during a Los Angeles class fieldtrip—a new species of marine pillbug (Crustacea: Isopoda). While documenting that new species, a second new species of pillbug originally collected 142 years ago by biologists on a wooden sailing ship in Alaska was discovered in a collection room at the Natural History Museum of Los Angeles County (NHM) by researchers Adam Wall and Dr. Regina Wetzer. The Los Angeles discovery was made during a Loyola Marymount University field trip for an invertebrate zoology lab course taught by NHM researcher Dean Pentcheff. The new species wasn't discovered in one of California's pristine Marine Protected Areas, but a dirty, little, rocky beach at the very southernmost tip of the city of Los Angeles—less than a mile from the busiest port in America. "We discovered it clutching on for dear life to one of the five arms of a common sea star," said Pentcheff. "As soon as we saw this bumpy little guy, we knew it was something special that the researchers at NHM had to see, but my class and I had no idea we were looking at a new species." 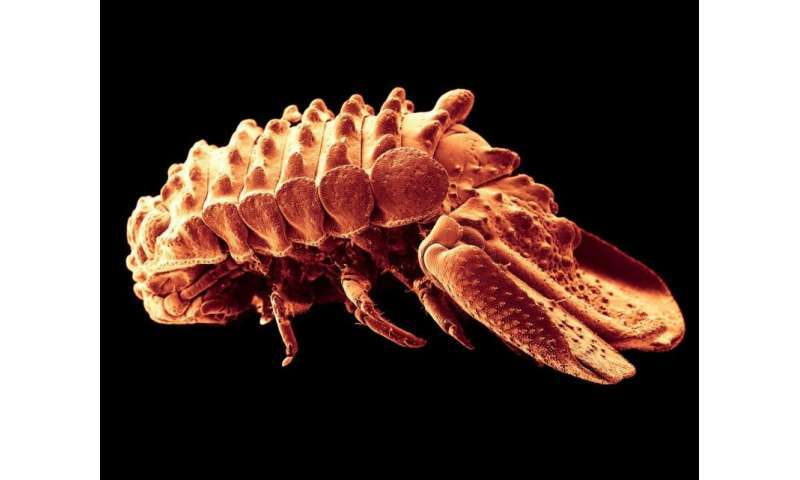 This newly discovered marine pillbug (or isopod, as it is known to biologists) is directly related to the terrestrial pillbugs found in backyards. Despite their misleading common name, all pillbugs (including the ones in your backyard) are not insects at all. They are crustaceans specially adapted for living on dry land. Pentcheff knew the strange looking animal was an isopod but needed help learning more. He handed the specimen off to world isopod experts Dr. Regina Wetzer, Associate Curator and Director of the Marine Biodiversity Center, and Adam Wall, Assistant Collections Manager for Crustacea at NHM. "Once we got the specimen to the Museum, we knew it was something unusual. But it was so small that we couldn't just use a normal light microscope to study it. We had to use a scanning electron microscope," said Adam Wall, lead author of the scientific paper describing the new discovery. "It is amazing to think that you can discover a new species in one of the most urban places in the world like the Port of Los Angeles," says Wall. "What is even better is that it wasn't an older guy wearing a white lab coat or a marine biologist in SCUBA gear that discovered it. It was a group of college students and their teacher in a regular college class—true citizen scientists," said Wall. The surprises didn't stop there. 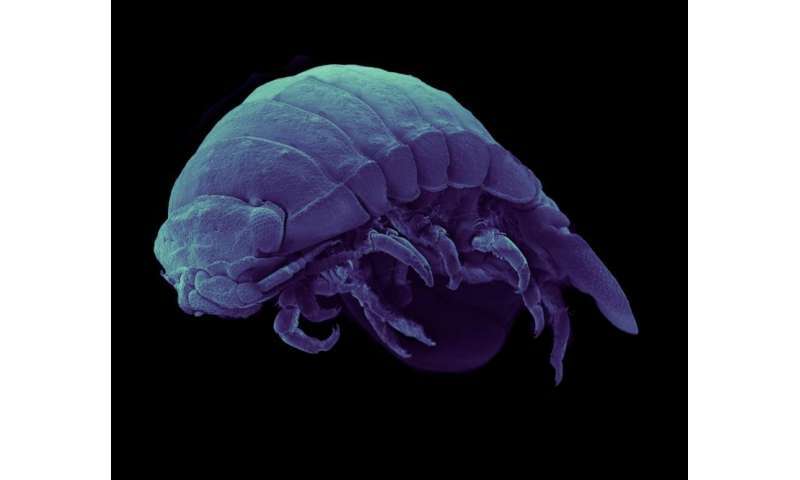 While comparing the new species to specimens in the NHM Crustacea collection, as well as other collections from around the world, Wall and Wetzer discovered a second new species that had been preserved, unrecognized, for over a century. "It was really exciting to discover a new species that had just been hiding in a collection room for 142 years, waiting for someone to come along and realize it was a new species," said Wall. "NHM's Crustacea collection is the fourth largest in the world, with millions of specimens in it. There are more new species in it, waiting to be discovered." "One of the best things about discovering a new species is you get to name it. We named the new species from Los Angeles Exosphaeroma pentcheffi in recognition of the amazing teacher who discovered the first specimen. We named the 142-year-old Alaskan species Exosphaeroma paydenae in honor of Joan Payden, a passionate supporter of science at the Museum, whose support made this discovery possible," said Wall.